Singapore’s residential accommodation rental rates for a three-bedroom apartment have increased by more than 30% from 2006 to 2007 and it is now ranked 5th in Asia, according to a recent survey conducted by ECA International, the world's leading knowledge and solutions provider for international human resources professionals. Undertaken annually, ECA’s Accommodation Survey ranking compares rental prices in 92 locations worldwide. The survey data is used in ECA’s Accommodation Reports, which ECA Member companies and clients consult when calculating housing policy and allowances for their internationally mobile staff. 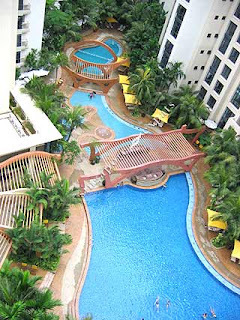 Ranked as the 9th most expensive location in the survey globally, a three-bedroom apartment in a popular expatriate area in Singapore costs approximately USD 4,460 per month on average. This is 33% higher than in 2006, when the equivalent apartment would have cost approximately USD 3,364, and the highest year to year percentage increases in Asia followed by Mumbai and Guangzhou. Although rental prices in Singapore are rising, an equivalent property in Hong Kong, the survey’s most expensive location, costs more than double to rent. 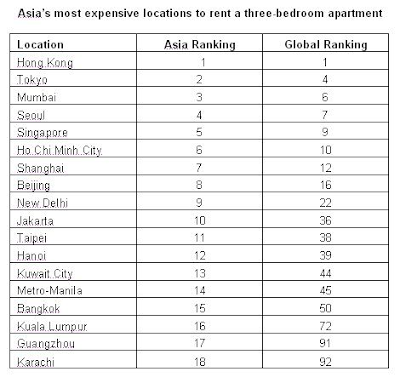 In Tokyo, the 2nd most expensive Asian location, a three-bedroom apartment costs more than 60% to rent than in Singapore. “While accommodation costs in Singapore have increased considerably over 12 months, it remains a competitive location for companies moving staff into the region, since accommodation is one of the largest costs borne by a company when moving staff overseas” explains Quane. Six of the top 10 most expensive locations in the world are in Asia, with Hong Kong (1st), Tokyo (4th), Mumbai (6th) Seoul (7th), Singapore (9th) and Ho Chi Minh City (10th) taking the lead. 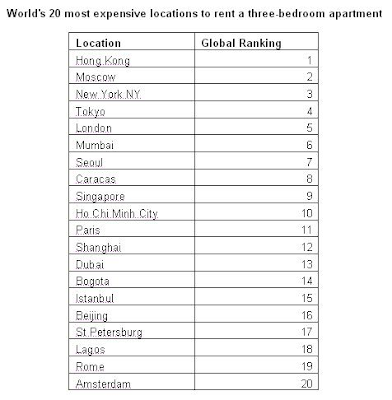 Moscow, New York, London and Caracas make up the 10 most expensive cities globally to rent a three-bedroom apartment. High rental prices in Moscow, New York, Tokyo, London and Seoul largely reflect high living costs in these locations, while in Mumbai and Ho Chi Minh City, increasing demand has pushed prices up. Caracas – which has seen the survey’s greatest rental price rise (41 per cent) – makes the top ten since it is not unusual for dangerous locations, such as this, to be expensive for foreigners who will prefer to reside in more costly compounds where security is good. 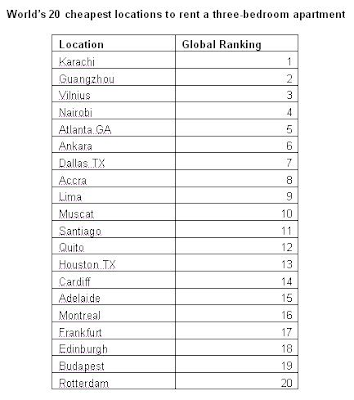 According to the survey, Karachi is the cheapest city in the world to rent a three-bedroom apartment, with the average monthly rent nearly eight times cheaper than the equivalent accommodation in Singapore. Atlanta, Nairobi, Vilnius and Guangzhou make up the bottom five cheapest cities to rent. In India, rental prices in Mumbai have increased by 21% in the last twelve months – the second biggest increase in the region after Singapore. The city is the 3rd most expensive location in Asia and ranks 6th globally. New Delhi, which is also rising up the ranking, is in 22nd position globally. A low supply of quality apartments coupled with increased demand in these cities is behind these high positions in the ranking. In China, rental prices in Shanghai, ranked 12th globally, continue to rise at a steady rate as demand increases. Beijing is ranked 16th. Rents in Guangzhou, placed 91st, rose by 18% between 2006 and 2007 mainly as a result of rapidly increasing demand. Some of the survey’s biggest rank movements have been experienced in the Middle East with Abu Dhabi, Sharjah and Doha rising 19, 17 and 12 places respectively. This is generally the result of high demand that has not been met with a supply of suitable properly. Dubai, ranked 13th, remains the most expensive location for renting property in the Middle East. In Europe, rental prices have increased the most in Moscow (by 29%) between 2006 and 2007, consolidating its position as the most expensive European location followed by London and Paris. Bucharest, which has experienced rental prices rises of 23% this year, is the region’s biggest climber up the ranking, while Vilnius is the cheapest place in the region to rent a three-bedroom apartment. Lagos, ranked 18th, is the most expensive African location, while Nairobi (89) has the continent’s least expensive rental property for expatriates. In Australasia, rental property is more expensive in Sydney (32) than in Perth (49); followed by Auckland (61), Melbourne (71), and Adelaide (78). ECA International is the world’s largest membership organisation for international human resources professionals, serving a global network of over 4000 HR professionals in 71 countries. The leading provider of online data, software solutions and advice for more than 1500 international companies, ECA’s innovative approach has been providing cost-effective solutions to international HR management since 1971. ECA’s services cover: cost of living indices, accommodation and benefits, expatriate and local remuneration, tax, social security and labour legislation, international assignment packages, daily business expenses rates and consultancy specialising in international HR policies. ECA’s Accommodation Survey is used to compile individual Accommodation Reports. Each report is a guide to the costs and procedures of renting expatriate accommodation within particular cities around the world. They are used by multinational companies to assist them in providing suitable accommodation allowances to their expatriate workforce in their locations of operation. Accommodation Reports are available to non-members companies as well as ECA member clients. ECA has been producing Accommodation reports since 1996. ECA produces reports for 115 cities. These cities are chosen because ECA Member companies employ a significant number of expatriates in these locations and reliable rental prices and information are available. For the purposes of year on year comparison 92 cities have been used in the rankings. To ensure impartiality and maintain accuracy of information, data from a number of sources is used to compile each Accommodation report. The principal sources being: ECA survey data, specially collected surveys and information from letting agents and relocation agents. 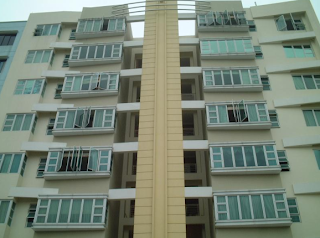 The rental prices were collected in September 2007 and have been converted into USD for ease of comparison using the September 2007 exchange rate.